Rabbi Chaim Ashkenazi was found dead in a collapsed building resulting from Tuesday's 7.1 magnitude earthquake. The bodies of one of the missing Jews in Mexico has been found. ZAKA-Kedana announced that they had found the body of Rabbi Chaim Ashkenazi at a collapsed building in Mexico City during the Rosh Hashanah holiday. Rabbi Chaim Ashkenazi, the son-in-law of Mexico's Chief Rabbi Shlomo Tawil, was apparently trapped under the rubble after Tuesday's 7.1 magnitude earthquake rocked Mexico City. "After Shabbat ended, we received an update from our team in Mexico that the missing Jew was indeed found dead. Our team was in the area from the moment of the earthquake until they received an update that there are no more missing Jews" said ZAKA International Director Mati Goldstein. A Jewish man residing in Mexico City told the Behadrei Haredim internet site that "the body was found an hour after the holiday started. The search was carried out by haredi Jews, some of them rescue workers, who hoped to find him alive, or at least not to be found alive. His son and wife were there when the body was found. " 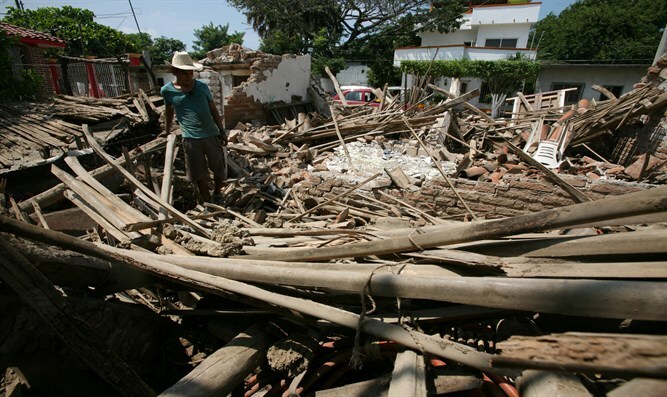 ZAKA-Kedanah had worked frantically throughout the holiday to find the two missing Jews after a series of earthquakes left Mexico reeling. "Since Wednesday night, ZAKA has been working in places where buildings collapsed and local Jews are unaccounted for," said ZAKA Mexico director Marcus Cain. "Finding missing Jews is a mission of utmost importance. We will not cease searching until we succeed in finding them." On Saturday, an earthquake measuring 6.2 on the Richter scale hit Mexico City. No damage or injuries were reported. Meanwhile, the number of dead from Mexico's previous earthquake reached 300. At least 157 of those killed were in Mexico City. 20 children and two adults were found dead in a neighborhood school. Another 30 children and 12 adults are still missing. 115 people were rescued from the rubble. The earthquake measured 7.1 on the Richter scale.